The Fleur du Cap Theatre Awards today announced its nominees for 2017. These annual awards are regarded amongst the most valued and prestigious in the South African performing arts industry. This year’s ceremony will take place on Sunday, 18 March at 17:30 at the Baxter Theatre Centre in Cape Town and promises to be an “Elegantly Extravagant” evening. 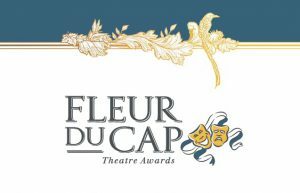 For over 50 years the Fleur du Cap wine brand has proudly associated itself with the Theatre Awards as displaying the flair that is synonymous with the wine. “Theatre is the showcase for generations of artists; it is an honour to support such a pivotal part of the industry,” says SA Brand Manager for Premium Wines, Khanya Mashalaba. Through awarding excellence in professional theatre Fleur du Cap wine and the Theatre Awards have played a significant role in the lives of South African theatre-makers. Winners are chosen from productions performed at professional theatre venues in and around Cape Town. Theatre practitioners are recognised for acting, directing, staging and technical ability. These nominations reflect the excellent theatre talent seen on stages throughout the Western Cape last year. For the first time, awards will be made in the categories of Best Performance in an Opera (Male), Best Performance in an Opera (Female), Best Performance by an Ensemble, Best Theatre Production for Children and Young People and Best Production. This year awards will not be made in the category Best Puppetry Design. The awards are considered in 26 different categories, including for Lifetime Achievement and Innovation in Theatre. The latter will be announced at the ceremony next month. The judges for the 2017 productions were Africa Melane, Dr Beverley Brommert, Eugene Yiga, Johan van Lill, Marina Griebenow, Maurice Carpede, Niel Roux, Tracey Saunders and Wayne Muller. A Handful of Keys, Angels on Horseback, Another One’s Bread, Aunty Merle the Musical, bash: latterday plays, Black, Boy Ntulikazi, Brother Love 2, Buzani Kubawo, Cathy and the Trolley Dollies, Chapter 2 Section 9, Cheers to Sarajevo, Der Fliegende Holländer, Die Dans van die Watermeid, Die Nag Van Legio, Die Reuk van Appels, El Blanco: Tales of the Mariachi, Evita, Evita Bezuidenhout and the Kaktus of Separate Development, Fiela se Kind, Funny Girl, Hamlet, Hemelruim, Immortal, In Bocca al Lupo, In Whorefish Bloomers: The Waitresses’ Lament, Joseph and the Amazing Technicolor Dreamcoat, Kafka’s Ape, Kidcasino, King Kong, Klara Maas se hart is gebreek, ensomeer: Die vloeistof-trilogie, From Koe’siestes to Kneidlach, Koöperasiestories, Kwamanzi, Macbeth: The Adult Panto, Mama Africa the Musical, Marat/Sade, Mate, Moedertaal, Nasty Womxn, Nice Coat (Lekker Jas), Niqabi Ninja, Peter Pan, Pieces, Police Cops in Space, Priscilla Queen of the Desert, Red Aloes, Renaissance, Rent, Rigoletto, Scenes from an Execution, Selwyn and Gabriel, Shakespeare in Love, Sherlock Holmes and the Curse of the Queen’s Diamond, Single Minded, So ry Miss Daisy, Songs of this Soil, State Fracture, Suddenly the Storm, Synergy, Tartuffe, The Eulogists, The Magic Flute, The Mother, The Mystery of Irma Vep, The Native Who Caused All The Trouble, The Play That Goes Wrong, The Rabble, The Visit, Thirst, Three’s a Crowd, Tiger Bay the Musical, Topdog/Underdog, Tswalo/Source, Twelfth Night, The Underground Library, Vlooi en die Koninginby/Kipper and the Queen Bee, What Remains and Who’s Your Daddy. The student panel adjudicated another 35 student productions, bringing the total number of productions that were considered in 2017 to an astounding 115. “The increased number of nominees in the category for Best New South African Script is extremely exciting as it means that local theatre-makers are becoming bolder in telling the stories that are at the heart of our collective lived experience. To see life imitating art in this way, is truly exhilarating. We thank Fleur du Cap wine brand, the hardworking panel of judges, theatre-makers and all the creatives behind the scenes who made this possible,” says Melanie Burke, chairman of the judging panel. A limited number of tickets for the ceremony at The Baxter Theatre will be on sale at R300 per person. However, there is no reason to miss this exciting annual event! For the first time in the history of the awards theatre lovers can share in the celebrations from the comfort of their own home, in real-time, through a virtual experience, at only R100 per ticket, standard data rates apply. Purchase your tickets from the Baxter Box Office on 021 685 7880 or Webtickets from 15th February 2018. Share your Flair with Fleur du Cap wine and celebrate excellence in theatre with the award recipients! Follow the awards on Facebook and on Twitter. For more information on: Fleur du Cap Wines.